We believe stories that have lifted generations bind us together as families and communities. 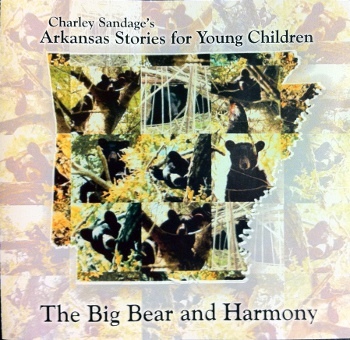 Here in Arkansas and around the world, those stories teach, encourage, warn, and inspire us. Each one of us can be a collector and teller of our own stories. In the Arkansas Stories project, we work to collect, understand, and interpret the stories people share with us. We retell them in various forms and for people of all ages, and we draw on our collective experience as historians, biologist, archaeologists, geologists, teachers, and writers to do so. Songs and stories performed by “Harmony” (Mary Gillihan, Robert Gillihan and Dave Smith) and Charley Sandage. 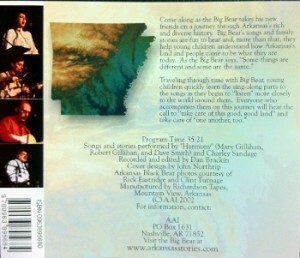 Recorded and edited by Dan Brackin. Cover design by John Northrip. Arkansas Black Bear photos courtesy of Rick Eastridge and Clint Turnage. Manufactured by Richardson Tapes, Mountain View, Arkansas.